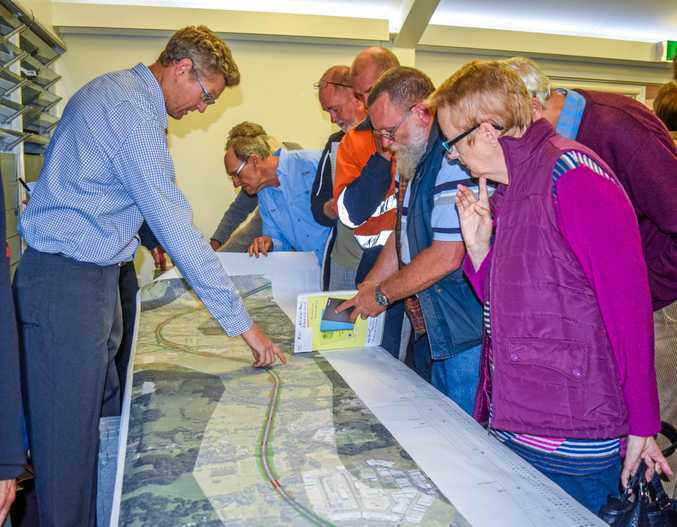 AFTER the Coffs Harbour bypass was again raised in Senate Estimates last week and questions raised over Federal Government funds for the $1 billion Pacific Highway project, former Chief Bridge Engineer Ray Wedgwood shared the history behind the proposed highway deviation. Here are some of the reader reactions to Ray's letter on Saturday. Coffs Harbour Bypass update: Senate Estimates discusses the Coffs Harbour Pacific Highway Bypass. I REFER to a Letter to the Editor published by the Advocate on Saturday written by Ray Wedgwood former Chief Bridge Engineer. Mr Wedgwood makes comment that an alternate by-pass proposal existed to follow roughly the line of Hogbin Dr. He states that the plan existed "50 years ago" when he attended Coffs Harbour High School. It matters not but I think that this plan might have been from the 1950's or even earlier. In fact I have also seen plans where the actual road reserve had been gazetted as restricted from encroachment by other development. This probably goes right back to when Park Beach was not settled at all and was in effect a seasonal swamp with few roads if any. I am a bit confused on his mathematics as it would seem that at first principles the Park Beach elevated bypass is not much cheaper (M$910) than the present proposed route via the ridges, hills and tunnels (Inner Bypass). I can only presume that his quoted cost for the latter of M$800 to B$1 is very optimistic, whereas the former is more straight forward and easier to calculate. If the present proposed "Inner Bypass" route is extremely optimistically costed as it appears then it would be just that much longer before it is constructed - meanwhile the traffic north-south will continue to increase and congest until some serious accident raises the political temperature high enough and something is done. I was told many years ago that the elevated bypass through Park Beach was not politically acceptable and was abandoned many years ago because the raised road necessary would "cut the Park Beach Holiday area in two". I suppose in much the same way as the present Hogbin Drive does the same thing but at ground level. This is a major negative. In any case Mr Wedgwood's re-opening of the proposal is worth debating especially as it is already more simple, straight-forward and easier to cost. The land is still set aside for the road as far as I know as it has been for possibly 60 years. It would seem to be quicker to implement and be cheaper. The railway line already cuts the urban area in two. I can understand the objections to a raised road right through the centre of Park Beach but the city grows apace and the internal road structures already struggle to cope. Note that I am not personally advocating the Park Beach route but I think that some debate is worth having. My opinion is that a proper bypass of some sort is urgently needed and the sooner the better. 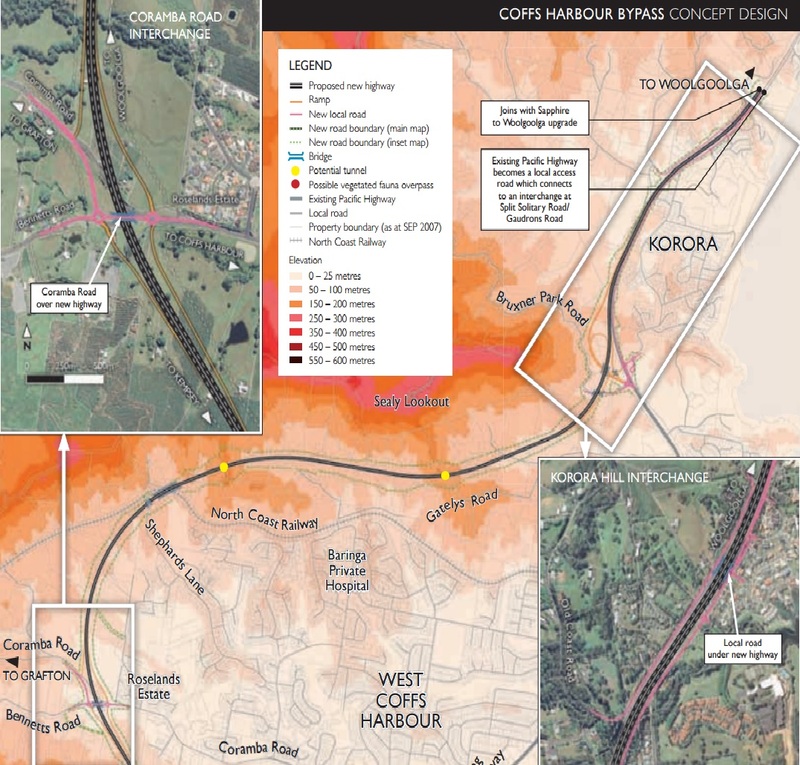 The north and western sections of the proposed Coffs Harbour bypass route as it appears on the RMS website. RAY Wedgwood is correct the Hogbin Dr corridor was the original highway bypass however, it was just one option. 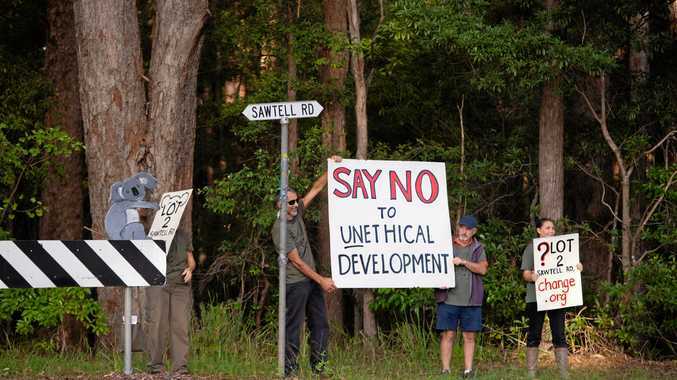 The present bypass is an insult to Coffs and despite all the objections is all we are offered. The far western bypass was the only intelligent and cost effective option and would have bypassed well north of Grafton. If it was built to the same design parameters as the Chinese highway from Beijing to the north western industrial cities with minimum tunnelling and an elevated highway from ridge to ridge and cutting the road through the top of the mountains, would have solved many problems. The days of following the valleys and tunnelling under mountains are over The Chinese design would be much more cost effective and be a complete bypass getting away from the coast where highway building costs are expensive. 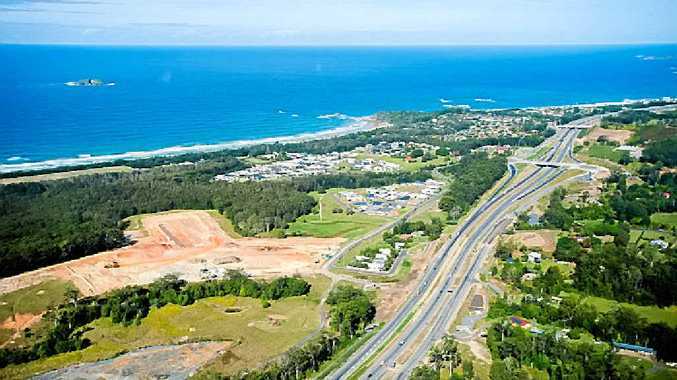 We would have saved millions on all the roundabouts and overpasses from the Sapphire to Woolgoolga section by going west and not putting a busy noisy freeway through prime real estate. Whilst I know my comments won't change the bypass of Coffs Harbour, objections to a poorly designed inadequate project should be aired. Unfortunately, too much money has been spent on the northern pacific highway for it to change, so we are stuck with the worst option. IT WAS refreshing to read Ray Wedgewood's take on a bypass using Hogbin Drive. From a typically Engineering point of view it can't be faulted, practical and economic. But what about the social upheaval? Our town is already bisected north to south by the railway, as are our Northern Beaches, east to west by the 'motorway'. Both have an aural impact on their surrounding areas and the impact on eastern Coffs would be intolerable. Having lived at Sapphire for a while, let me assure you that the noise attenuation measures are a waste of time other than for adornment and restriction of the adjoining coastal views. The 'preferred' route will carry the potential of a higher economic cost but its disturbance of the surrounding serenity will be no less for all those residents who live to the west in the 'Bowl'. On a balmy evening, relaxing outside up there, the tranquility is regularly disturbed by passing goods trains and the XPT. Building a motorway along that route will turn that occasional discomfort into a continuous assault on the senses. The completion of the Sapphire to Woolgoolga upgrade now dictates that a 'local' ring road is the only solution and we just have to bear it. It's a pity that back in the days when authorities constantly told us that a bypass wasn't possible, the officials who knew the truth did nothing and abrogated their responsibilities to effectively plan a solution that satisfied the needs of the National Infrastructure and the Environment of our community. Where Hogbin Dr is today, was once considered a route for the Pacific Highway bypass of the Coffs Harbour city centre. FIFTY years ago, when I was a lad at Coffs Harbour High School, the DMR had a scheme for an "Inner Bypass" route that ran along the east side of the golf course, crossed over High St to the east of the primary school, over Coffs Creek, then the railway line, through the parklands, over McCauleys Headland, rejoining the Pacific Hwy in front of Opal Cove. Recognise it? Hogbin Dr.
On completion of high school, I was accepted by the DMR as a cadet civil engineer. I remained with the DMR, involved with bridge design, construction and maintenance, design codes and planning, becoming the chief bridge engineer from 1987 to 2004, when I retired. I understand the current estimate for the proposed Coffs Western Bypass is between $800million to $1billion. On a cursory look at the current situation along Hogbin Dr plus (ie. the "Inner Bypass" of about 10km) on the basis of the need to keep traffic flows separate, I estimate 5km would require a viaduct above the existing Hogbin Dr and 5km could be constructed alongside. Based on current costs of motorway construction and taking into account the difficulties, it has been assumed that a cost of $50million/km would apply to the roadworks; bridge costs have been assumed to be $6000 per square metre of deck area. These assumptions lead to: road embankments = 5km @$50m/km, gives $250million; bridges/ viaducts = 5000 x 22 (deck width) x $6000, gives $660million. For a total of $910-million. To reduce these costs even further, it may be possible to permit some sections of Hogbin Dr to carry both local and motorway traffic. I suggest that, with the knowledge gained from other Pacific Motorway projects, the construction of an "Inner Bypass" would be much more predictable than the risks associated with the tunnelling required for the "Outer Western Bypass".